Yes, the elephants are still coming to town - at least in Lafayette, Indiana, a college town where some people are none too happy about a circus reportedly squeezing big cats into cages so small they can't avoid their own excrement. Circus Pages is one of the stubborn circuses around the country clinging to its elephants as Ringling Bros. and Barnum & Bailey phases out its elephants by 2018. But the circus won't perform without a fight. Animal advocates are protesting Circus Pages' visit, says Joel Kerr, executive director of the Indiana Animal Rights Alliance. Kerr told The Dodo that protesting smaller circuses is a particular challenge because "like it or not, smaller towns are going to be more OK with animal abuse." Circus Pages has a documented history of animal welfare problems. A routine USDA inspection conducted in November 2013 revealed a number of violations, including six tigers who were in cages so small they were forced to be in contact with their own "excreta." And two of the tigers inside their enclosures "were left outside the exhibit tent after the show without barriers," meaning the public could potentially have contact with the tigers. The most recent inspection in November 2014 by the USDA listed Circus Pages as having no violations. Most facilities are inspected on an annual basis, according to Tanya Espinosa, public affairs specialist at the USDA. Circus Pages was inspected six times in less than two years from 2013 to 2014. Espinosa says frequent inspections are likely due to noncompliances or "if we receive complaints." Circus Pages did not immediately respond to request for comment. The small circus, which is based in Florida but says it originated in Cuba in the 1960s, is currently weaving its way through Indiana, and holding two performances Thursday in Lafayette. The circus manager told the Lafayette Journal it has no plans to retire its two African elephants, Daisy and Bambi. The pair of elephants was captured from the wild in Africa in 1975. They were eventually acquired by Circus Pages in 1990 and have been traveling the country performing for crowds for the past 25 years. 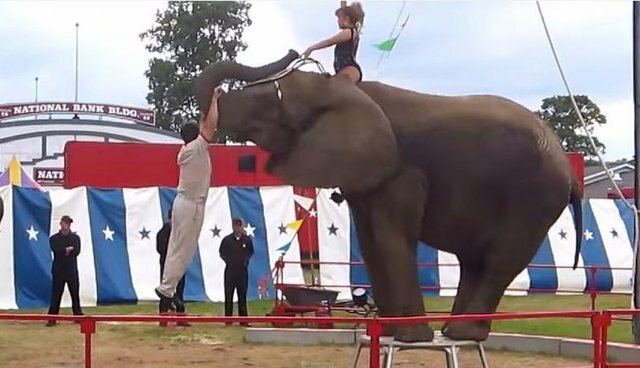 Circus Pages claims to have elephants, lions, horses, camels and rare white tigers amongst its animal act, and it offers elephant rides to its attendees. 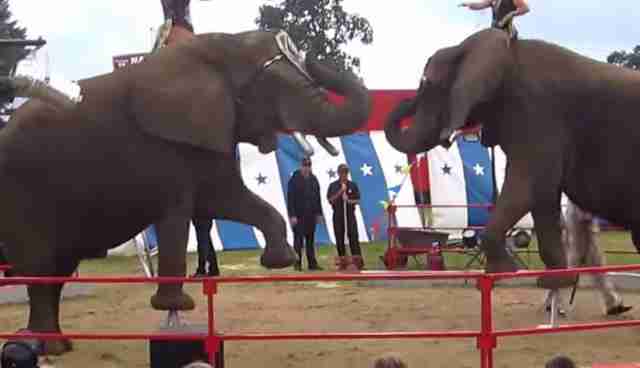 Journalist Carol Bradley, the author of "Last Chain on Billie," says that, unfortunately, many smaller circuses provide elephant rides. "People want to ride elephants and want their children to because they are in awe of the animals," she told The Dodo. "I shudder at the thought of anyone riding a captive elephant because they can and have gone crazy because of their captivity." Bradley also describes the life of an exotic animal in a traveling circus as a grueling existence on the road with little opportunity for exercise or social interaction. "They live on the back of semi-tractor trailers," she said. "That is their home. For most of the year, these animals are on the road and they are restrained in some way. They are tethered, and in cold months they don't even get to mill about in the parking lot between shows. If people think that circus animals spend a fraction of their time performing and most of their time living freely in some big meadow, that is not true." On its homepage, Circus Pages touts a photo of Daisy and Bambi frolicking in their "private pond." 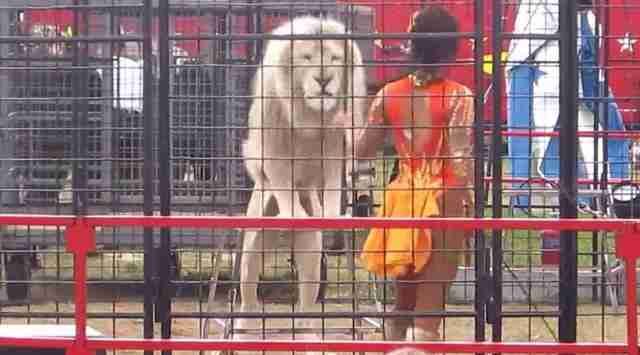 Animal welfare groups also condemn the conditions for big cats in circuses. Adam Roberts, the CEO of Born Free USA, says the circus "is no place for big cats," who are often trained with aggressive tactics. Here's a video of the Circus Pages' lions and elephants performing in 2013. To learn more about how to end animal cruelty in circuses, visit Born Free USA or PAWS.